Syria’s friend (Turkey) depriving Syrians from their share of Euphrates water for two weeks now. The Turkish government recently cut off the flow of the Euphrates River, threatening primarily Syria but also Iraq with a major water crisis. Al-Akhbar found out that the water level in Lake Assad has dropped by about six meters, leaving millions of Syrians without drinking water. Two weeks ago, the Turkish government once again intervened in the Syrian crisis. This time was different from anything it had attempted before and the repercussions of which may bring unprecedented catastrophes onto both Iraq and Syria. Violating international norms, the Turkish government recently cut off the water supply of the Euphrates River completely. In fact, Ankara began to gradually reduce pumping Euphrates water about a month and half ago, then cut if off completely two weeks ago, according to information received by Al-Akhbar. “We should cut off or reduce the water output of the dam, until the original problem regarding the blockage of the water supply is fixed,” the source explained. The Islamic State in Iraq and Syria (ISIS) controlling the region the dam is located in did not suspend the water output. Employees of the General Institution of the Euphrates Dam are running the lake under the supervision of al-Qaeda linked ISIS, but they don’t have the authority to take serious decisions, such as reducing the water output. In addition, such a step is a mere attempt to ease the situation, and it will lose its efficacy if the water supply isn’t restored to the dam by Turkey. The tragic repercussions of the new Turkish assault began to reveal themselves when water levels dropped in al-Khafsa in Aleppo’s eastern countryside (where a water pumping station from Lake Assad is located to pump water through water channels to Aleppo and its countryside). The reservoirs are expected to run out of water completely by tonight or tomorrow morning at the latest. Meanwhile, water supplies in auxiliary reservoirs in al-Khafsa are close to being depleted and the reservoirs are expected to run out of water completely by tonight or tomorrow morning at the latest. This threatens to leave seven million Syrians without access to water. Also, Tishrin Dam stopped receiving any water which blocked its electricity generating turbines, decreasing the power supply in Aleppo and its countryside, further intensifying the already severe imbalance in the power supply. However, shutting down the dam (if ISIS agrees) will only lead to a human and ecological (zoological and agricultural) catastrophe in Syria and in Iraq. According to information obtained by Al-Akhbar, Aleppo locals (who had already launched many initiatives to reach solutions for a number of local issues) began a race against time to recommend solutions for the problem, including putting the thermal plant at al-Safira back to work, which may convince ISIS to spare the Euphrates Dam turbines, and in turn preserve current water levels in the lake. In case it succeeds, such a step would only rescue whatever water and structures are left, and would ward off further repercussions of the crisis that has already started. A halt to the water supply is now inevitable and can’t be resolved unless the Turkish government takes the decision to resume pumping Euphrates water. In any case, it is worth mentioning that the water in the lake would take about a month, after resuming pumping, to return to its normal levels. The Euphrates River has historically been at the center of a conflict between Turkey on the one hand and both Syria and Iraq on the other. Ankara insists on considering the Euphrates a “trans-boundary river” and not an “international river,” hence it is “not subject to international laws.” Also, Turkey is one of the only three countries in the world (along with China and Burundi) that opposed the Convention on the Law of the Non-Navigational Uses of International Watercourses adopted by the General Assembly of the United Nations in 1997. In 1987, a temporary agreement between Syria and Turkey was signed to share the water supplies of the Euphrates during the period when the basin of the Ataturk Dam was being filled. In virtue of the agreement, Turkey pledged to provide an annual level of over 500 cubic meters of water a second on the Turkish-Syrian borders, until reaching a final agreement about sharing the water supplies of the river between the three countries. In 1994, Syria registered the agreement at the United Nations to guarantee the minimum amount of Iraq and Syria’s right to the water from the Euphrates River. I’ve written about this for years. Syria has a plan for Erdoghan that will set back his Ottoman dreams by 500 years. It was developed by the late general, Daawood Rajiha, our former Defense Minister until he was assassinated by a Robert Ford-designed plot to “decapitate” the Syrian military high command on July 18, 2012. It didn’t work and the only one decapitated was Ford in a humiliating retirement reeking of failure. General Rajiha had developed a plan to use Syria’s huge ground-to-ground missile network to vaporize Turkey’s hydroelectric dams on the Euphrates River. Well, now’s the time with Erdoghan cutting off all water to both Syria and Iraq, damning our people to thirst and starvation. It is time for Iran and Russia cut off all gas supplies to Erdoghan and force him to release the waters of the great river which is the lifeline of the Fertile Crescent. Or! Let’s unleash a SCUD attack on all his dams. Well, what do you think about that? What if Dr. Assad did something really out of character, like, you know, telling some general to go ahead with General Rajiha’s plan? Wouldn’t that be really jolly? What would Erdoghan do? He can’t invoke the NATO Treaty because he declared war on Syria by cutting off water to a riparian landowner and violated international law in doing so. No, I think the Turk would be on his own. He’d have to explain to his people why they didn’t have any electricity or gas. There is this big dam named after Turkish republic founder, Kemal Mustafa Ataturk, which sits like a big bull moose ready for a 30×6 to take him down for a visit to the local taxidermist. Dr. Assad, it’s time you did something to end the Turkish gangsterism that is wreaking havoc with your country. We stand with you, all the way. Now, that’s the Ataturk dam. So plump and ready for the plucking. Oh, there’s that useless Patriot Missile system the Europeans are manning for the Turks. It won’t work because Syria’s SCUD missiles are not the ‘guided’ type, so it will be most difficult to either “topple” them or track them with guided anti-missile missiles. In any case, Syria has manufactured thousands based on an improved North Korean design. The Syrian missile establishment is one of the very biggest in the world. Heck, we make the missiles for Hizbullah. Nyuk. Many readers will chafe at the idea that the Syrians would cause so much suffering to the people of Turkey. Well, do you have any better ideas? And what do we do? Starve to death or die of thirst. We can’t irrigate our fields without the waters of the Euphrates. No, my friends, the people of Turkey have had it too easy so far. They have to feel the consequences of their government’ crimes. TORPEDO THE DAMS! FULL SPEED AHEAD! That’s what I say. TORPEDO THE DAMS FULL SPEED AHEAD ERDOGHAN MUST DIE! The flag and logo of an organization that was launched a few days ago in the Gaza Strip suggest a Hezbollah now exists in Gaza. The organization is called al-Sabirin (the patient) for the Victory of Palestine and its logo bears a striking similarity to Hezbollah’s logo. Local opponents accuse it of being a Shia movement but its officials deny the charge and stress that they coordinate with other factions to organize their positioning in the resistance. Gaza: Despite all the major turning points in the lives of Palestinians over the past 10 years, no party has offered a new political vision except a few youth organizations that have been stamped out by factional strife. Domestic strife has primarily been between Fatah and Hamas as each organization has aimed to control the political and economic map in the occupied West Bank and Gaza over the past seven years. In the Arab world, there are tensions simmering against a sectarian and ethnic backdrop under the banner of the Arab Spring. The social makeup in Gaza, which prides itself on its strong family ties, was impacted by factional differences and clashes. However, on a religious level, Gaza does not tolerate diversity as Sunni Muslims constitute the overwhelming majority. Therefore, the creation of a new organization poses “serious concerns regarding the path it is going to take.” Al-Sabirin talks about fighting Israel but its slogan carries connotations that make some view it as a “sectarian movement.” The circumstances and timing that the organization chose to announce its creation further complicate the matter. There is the reconciliation process between Fatah and Hamas while the Islamic Jihad expressed reservations regarding some of the terms dealing with the weapons of the Resistance. In the Arab world, there are tensions simmering against a sectarian and ethnic backdrop under the banner of the Arab Spring. In this context, the new organization puts itself in a position that raises a lot of questions and is even subject to numerous accusations. Sources from al-Sabirin say that they are “well aware of the difficulty of the Palestinian and regional circumstances,” that is why the organization is presenting itself as a “Palestinian resistance movement that seeks to free all of Palestine and does not believe in any negotiated agreements or even long-term truces with Israel.” Nevertheless, it announced its creation after the death of one of its cadres (Nizar Issa) in an explosion they said was the result of a manufacturing error. It was forced to declare itself so it can claim responsibility for him but the organization pointed out that they have been operating for years. The Palestinian resistance had spawned in the 1960s more than 27 military and political organizations. Some of them have survived until today while others have become less important. Some organizations ceased to exist altogether and others turned to political activism. Each landmark juncture in the history of the struggle against Israel was characterized by the declaration of a new faction. The Arab defeat after al-Nakba led to the founding of the Popular Front for the Liberation of Palestine (PFLP) and the Palestinian National Liberation Movement also known as Fatah. With the decline of the communist movement in the region, the PFLP’s role declined and so did the role of Fatah after it left Beirut and became distant from the geographic region surrounding Palestine. We do not deny any of our members the freedom to choose the sect according to which they worship God within the context of the sects recognized by Islamic law. Before Fatah turned to political action, the first intifada (1987) which began as a popular movement shored up two Islamist resistance movements, Hamas and Islamic Jihad. With the start of the second intifada, Fatah – armed with a quasi-official decision – returned to military struggle through al-Aqsa Martyrs Brigade and Ahmed Abu al-Rish Brigades. But President Mahmoud Abbas diminished the role and presence of the former and the latter disintegrated. Since then, no Palestinian organization with a new political program has been declared, except for small military organizations. In 2008, an organization called the Palestinian Hezbollah was declared in the West Bank but the Palestinian Authority (PA) and Hamas met this move with skepticism. This new faction, however, which described itself as “Sunni Jihadi Islamist and opposed to the political process,” did not last for long and no one has heard from them again. In addition, a military cell in Gaza named the Imad Mughniyeh Groups declared its responsibility for several operations. Eventually, it became evident that this cell was associated with Fatah. Linking these organizations to Iran and Hezbollah is a very sensitive subject in Gaza. That is why some Arab and Israeli media outlets try to associate resistance movements with certain sectarian situations. Such as the incident years ago when the Palestinian police affiliated with the Hamas government attacked a group that was holding a consolation session on the 40-day memorial for Hussein in northern Gaza. The city of Khan Younis in the south of the Gaza Strip witnessed in the past months fist fights and armed clashes between the followers of a Salafi cleric who regularly attacked the Syrian regime, Iran, Hezbollah and Islamic Jihad members before Islamic Jihad contained the situation. Security sources familiar with the coordination effort between Palestinian factions told Al-Akhbar that a meeting was held between al-Sabirin and Hamas to sort out the former’s status as a Palestinian resistance movement that is going to work out of Gaza, as long as it is committed to the general framework of the agreements between the various organizations. But they refused to delve into other details about having al-Sabirin representatives at the Factions Coordinating Committee and their view on pacification. The new organization said that they established good communication channels with other parties and with the government. The security situation in Gaza forces any political or military faction to coordinate with Hamas since it is the largest resistance movement in Gaza irrespective of how the reconciliation effort and the security issue will play out. The internal security agency affiliated with the government and the special security agency affiliated with al-Qassam Brigades, Hamas’ military wing, follow up with these organizations. As to whether the Palestinian landscape needs another organization, Abu Yousef says: “In light of the new conspiracies to liquidate the Palestinian cause, the fact that the Arab and Islamic worlds are preoccupied with other issues and the two major Palestinian factions are heading towards a political solution, we concluded that we have a religious duty to step forward at this stage to help the Palestinian cause reclaim its rightful place and rectify the direction it is taking. Palestine requires sacrifices and this path does not end as long as our land is occupied. Hezbollah’s announcement of the martyrdom of one of its leaders in Syria, Fawzi Ayoub, angered the Israeli media, which refocused on Hezbollah’s role in supporting the Palestinian factions inside Palestine. Especially Ayoub who was arrested in the West Bank in 2000 and was released as part of a prisoner swap deal. Tel Aviv always accuses Tehran, Damascus and Hezbollah of providing financial and military aid to Palestinian factions, training their fighters, sending experts to help them and creating sleeper cells. Not much comes up on Abu Mohammed when you try to find out who he is because he is a mysterious figure and moves about secretly. He has been a wanted man by Israel for 18 years. His name became prominent in resistance circles after the Israeli forces tried to arrest him at the beginning of the Intifada for an operation that killed 35 Israeli soldiers in Tel Aviv. But he left his house before they arrived. So they decided to demolish his home, which consists of six floors. This led to the martyrdom of his father and displacement of his family. He is accused of having a strong relationship with influential figures in the Islamic Republic in Iran which means he is being watched by Hamas’ security agencies. They arrested him more than once without being able to prove anything against him. He was also imprisoned by Israel and the Palestinian Authority in the 1980s and 1990s. The Syrian army continued Friday its operations against the terrorist groups in several provinces, including Aleppo, Daraa, Idleb, Homs and Latakia, inflicting heavy human and materialistic losses upon them. The Syrian army controlled the villages of Sateh Zahnan and al-Taff in Daraa countryside and eliminated a number of militants. 2 civilians were killed and some 85 others wounded after terrorists fired rocket shells at Aleppo neighborhoods. Terrorists mortar attack claimed the lives of two citizens and injured 13 others in Danoun Camp in al-Kisweh area in Damascus Countryside. Politically, The presidency of the Syrian Arab Republic thanked the Syrian citizens abroad for their wide participation in the Presidential elections. The flood of the Syrian voters in Beirut has surprised the whole world, what pushed US sources to say that the Syrian refugees in Lebanon and Jordan has granted the Syrian government a strategic power, al-Binaa Lebanese newspaper reported. The US sources considered that Syria has established an army of refugees in Lebanon and Jordan and that only the return of these refugees to their country will require a political settlement. The sources added that the loss of control over certain areas did not deprive the Syrian authorities from its strategic role in the region, yet the Syrian refugees in Lebanon and Jordan has given Syria an influence over areas, what was impossible to be attained. The United Nations Under-Secretary-General for Political Affairs, Jeffrey Feltman, informed the Saudis about the necessity of reaching a political solution in Syria as soon as possible because of the strategic achievements which the Syrian government is attaining. Why are They Afraid of the Syrian Elections? By Pepe Escobar A specter is haunting Washington, an unnerving vision of a Sino-Russian alliance wedded to an expansive symbiosis of trade and commerce across much of the Eurasian land mass – at the expense of the United States. And then, talking about anxiety in Washington, there’s the fate of the petrodollar to consider, or rather the “thermonuclear” possibility that Moscow and Beijing will agree on payment for the Gazprom-CNPC deal not in petrodollars but in Chinese yuan. One can hardly imagine a more tectonic shift, with Pipelineistan intersecting with a growing Sino-Russian political-economic-energy partnership. Along with it goes the future possibility of a push, led again by China and Russia, toward a new international reserve currency – actually a basket of currencies – that would supersede the dollar (at least in the optimistic dreams of BRICS members). Of course, the US dollar remains the top global reserve currency, involving 33% of global foreign exchange holdings at the end of 2013, according to the IMF. It was, however, at 55% in 2000. Nobody knows the percentage in yuan (and Beijing isn’t talking), but the IMF notes that reserves in “other currencies” in emerging markets have been up 400% since 2003. The Federal Reserve is arguably monetizing 70% of the US government debt in an attempt to keep interest rates from heading skywards. Pentagon adviser Jim Rickards, as well as every Hong Kong-based banker, tends to believe that the Fed is bust (though they won’t say it on the record). No one can even imagine the extent of the possible future deluge the US dollar might experience amid a $1.4 quadrillion Mount Ararat of financial derivatives. Don’t think that this is the death knell of Western capitalism, however, just the faltering of that reigning economic faith, neoliberalism, still the official ideology of the United States, the overwhelming majority of the European Union, and parts of Asia and South America. As far as what might be called the “authoritarian neoliberalism” of the Middle Kingdom, what’s not to like at the moment? China has proven that there is a result-oriented alternative to the Western “democratic” capitalist model for nations aiming to be successful. It’s building not one, but myriad new Silk Roads, far-reaching webs of high-speed railways, highways, pipelines, ports, and fiber-optic networks across huge parts of Eurasia. These include a Southeast Asian road, a Central Asian road, an Indian Ocean “maritime highway” and even a high-speed rail line through Iran and Turkey reaching all the way to Germany. In April, when President Xi Jinping visited the city of Duisburg on the Rhine River, with the world’s largest inland harbor and right in the heartland of Germany’s Ruhr steel industry, he made an audacious proposal: a new “economic Silk Road” should be built between China and Europe, on the basis of the Chongqing-Xinjiang-Europe railway, which already runs from China to Kazakhstan, to continue through Russia, Belarus, Poland, and finally Germany. That’s 15 days by train, 20 less than for cargo ships sailing from China’s eastern seaboard. Now that would represent the ultimate geopolitical earthquake in terms of integrating economic growth across Eurasia. Keep in mind that, if no bubbles burst, China is about to become – and remain – the number one global economic power, a position it enjoyed for 18 of the past 20 centuries. But don’t tell London hagiographers; they still believe that US hegemony will last, well, forever. Despite recent serious financial struggles, the BRICS countries have been consciously working to become a counterforce to the original and – having tossed Russia out in March – once again Group of 7, or G-7. They are eager to create a global architecture to replace the one first imposed in the wake of World War II, and they see themselves as a potential challenge to the exceptionalist and unipolar world that Washington imagines for our future (with itself as the global robocop and NATO as its robo-police force). Historian and imperialist cheerleader Ian Morris, in his book War! What is it Good For?, defines the US as the ultimate “globocop” and “the last best hope of Earth”. If that globocop “wearies of itsrole”, he writes, “there is no plan B”. In Washington’s think-tank land, the conviction that the Obama administration should be focused on replaying the Cold War via a new version of containment policy to “limit the development of Russia as a hegemonic power” has taken hold. The recipe: weaponize the neighbors from the Baltic states to Azerbaijan to “contain” Russia. Cold War 2.0 is on because, from the point of view of Washington’s elites, the first one never really left town. Yet as much as the US may fight the emergence of a multipolar, multi-powered world, economic facts on the ground regularly point to such developments. The question remains: will the decline of the hegemon be slow and reasonably dignified, or will the whole world be dragged down with it in what has been called “the Samson option”? While we watch the spectacle unfold, with no end-game in sight, keep in mind that a new force is growing in Eurasia, with the Sino-Russian strategic alliance threatening to dominate its heartland along with great stretches of its inner rim. Now, that’s a nightmare of Mackinderesque proportions from Washington’s point of view. Think, for instance, of how Zbigniew Brzezinski, the former national security adviser who became a mentor on global politics to President Obama, would see it. In his 1997 book The Grand Chessboard, Brzezinski argued that “the struggle for global primacy [would] continue to be played” on the Eurasian “chessboard”, of which “Ukraine was a geopolitical pivot”. “If Moscow regains control over Ukraine,” he wrote at the time, Russia would “automatically regain the wherewithal to become a powerful imperial state, spanning Europe and Asia.” That remains most of the rationale behind the American imperial containment policy – from Russia’s European “near abroad” to the South China Sea. 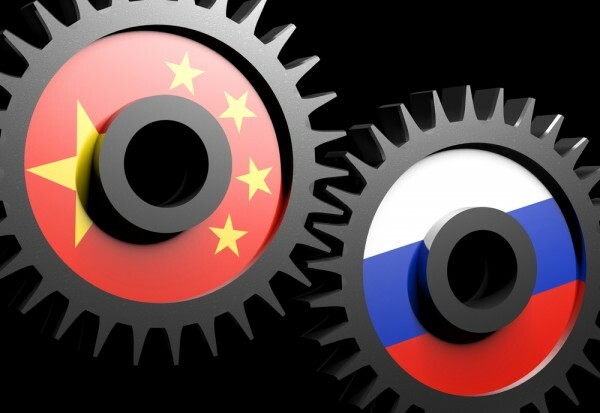 Still, with no end-game in sight, keep your eye on Russia pivoting to Asia, China pivoting across the world, and the BRICS hard at work trying to bring about the new Eurasian Century. Pepe Escobar is the author of Globalistan: How the Globalized World is Dissolving into Liquid War (Nimble Books, 2007), Red Zone Blues: a snapshot of Baghdad during the surge (Nimble Books, 2007), and Obama does Globalistan (Nimble Books, 2009). He may be reached at pepeasia@yahoo.com. Posted with permission of TomDispatch. Follow TomDispatch on Twitter and on Facebook or Tumblr. Check out the newest Dispatch book, Ann Jones’s They Were Soldiers: How the Wounded Return From America’s Wars – The Untold Story. The same is true in the various regions of the Damascus countryside where living standards vary dramatically. Al-Nusra Front fighters come at the very top because they receive a lot of money from their organization allowing them to buy goods at exorbitant prices in the flashpoint areas of the Damascus countryside. “Five hundred thousand Syrian pounds (about $3,000) which is the price of a 50 Kilogram (110 lb) bag of rice in the Yarmouk camp means nothing to al-Nusra fighters. With their wealth they have no problem securing their own food and drink,” adds Shihab. The Free Syrian Army’s fighters are the “poorest and they often get their resources from theft while al-Nusra Front and Jaish al-Islam’s fighters refrain from stealing.” But the main reason, according to Nabulsi, is that the two other organizations “have no need to rob the poor as long as they receive large sums of money from abroad. This allows them to look down on those they have starved with false morals such as imposing hudud punishment (a punishment fixed in the Quran and hadith for crimes considered to be against the rights of God) on thieves. It is commonplace for Jaish al-Islam and al-Nusra Front fighters to hold banquets during their meetings or on special occasions such as announcing a certain victory or establishing a new military group or merging with another group, “while hunger haunts the rest of the people only dozens of meters away from them.” A picture that was posted on social media sites shows Islamic Front fighters attending a banquet and fine dining in the Yarmouk camp at the height of the famine that struck the camp. “Most of them stayed in their neighborhoods because they do not have the means to bear the burden of displacement.” The specter of famine is now threatening civilians in several areas in the Damascus countryside. While foodstuffs have disappeared in certain regions where they live and smuggled goods – that usually come to the “rich fighters living the high life” – are too expensive, their lives have become more like death. 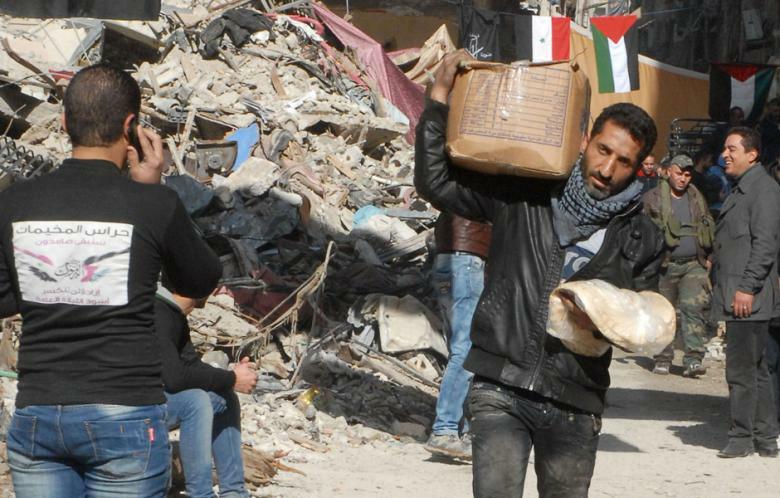 “Even the aid that the state tried to send in is seized upon by those who wield power in a given area,” according to an activist in the Syrian Red Crescent. There are two types of fighters that prevent food from getting to those in need. The first type consists of hungry fighters and the second type consists of fighters who profit from food smuggling.